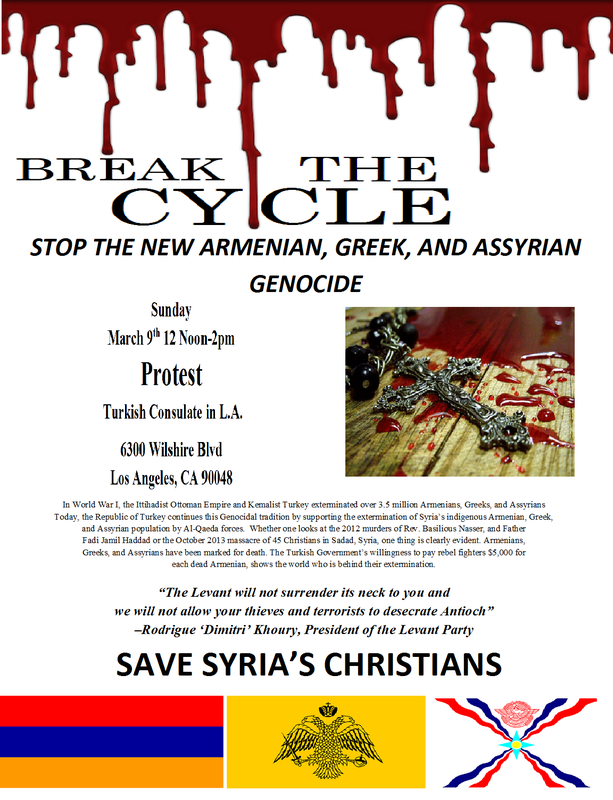 On March 9th, a united coalition of American citizens of Greek, Assyrian, and Armenian descent will rally outside the Turkish Consulate in Los Angeles, California in protest of Turkey’s continued support of Genocide inside Syria. The March 9th protest is held in solidarity with a campaign started by the Levant Party of Lebanon. This past December the Levant Party protested outside the Turkish Embassy in Beirut. 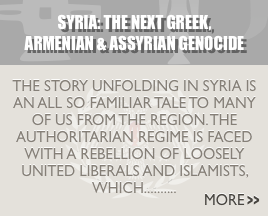 The March 9th protest hopes to highlight Turkey’s continued policy of denial towards the Armenian, Greek, and Assyrian Genocides, as well as their continued support of the extermination of Syria’s indigenous Armenian, Rum (Greek), and Assyrian population by Al-Qaeda forces. From proving Jihadists with shelter and arms to paying rebel fighters, $5,000 for each dead Armenian, Turkey has played a vital role in the supporting the Syrian Opposition. 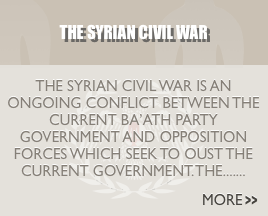 They have allowed Opposition Forces to have their headquarters in Constantinople, and provided the Free Syrian Army and Islamic Extremists with weapons and based to operate from within Turkey. Turkey’s National Intelligence Organization, MIT, has even gone as far as providing equipment and weapons to organizations such as, Al-Nusra. Whether one looks at the Sadad Massacre, the kidnapping of 12 Greek Orthodox Nuns from Maaloula, or the still captive Greek Orthodox and Syrian Orthodox Bishops of Aleppo. One truth is clearly evident. Syria’s ethnoreligious minorities are facing nation-wide extermination at the hands of Turkey’s allies. We, the Daimones of Collective Hellenism, support Mr. Aliferis for taking the initiative to organize this protest. We, the Daimones ask others to follow suite, and organize similar actions across the country. We must not wait for our mainstream groups to take action, but instead led the way ourselves.